Aluminum pigment market is expected to show a significant rise in the market due to its multiple uses in paints, plastics, and personal care sectors. The market is dominated by majorly large and mid-sized players. There is very little scope left for new players to enter the market. According to a report by Transparency Market Research, the major companies such as Silberline Manufacturing Co. Inc., Altana AG, Carl Schenk AG, and three other held 48% share in the global aluminum pigments market in 2015. The global aluminum pigment market is expected to rise at a strong CAGR of 6.4% by 2024. The market was worth US$ 332 mn during 2015 and is estimated to rise upto US$ 581 mn by 2024. According to volume, the market held a value of 46 kilotons during 2015. The end user segment is dominated by personal care industry and it is expected to rise during the forecast period due to increase demand in consumption of various products under this segment. Geographically, Asia Pacific is leading the market with China demonstrating a potential rise in the market due to increased production and consumption rate. The rise in coatings, paints, and automobile enterprises is likely to boost the market for aluminum pigments. The increase in consumption of automobile enterprises in developing industries such as Asia Pacific is the major factor for rise in growth of the market. The consumer rate is rising in this region with increase in manufacturing offices and foundation of assembling. The rise in disposable income is increasing the rise in usage of commercial and public vehicles. These factors will show a significant rise in the market. There is also a rise in demand for ale pack of color choices for vehicles which is increasing the demand for aluminum pigments in the automobile business. The improvement in automobile business is likely to be the key factor for rise in global aluminum pigment market. The utilization of aluminum pigments in various industries like personal care, coating, plastics, and paints are proving to be of high development potential in the market. The increase in construction business due to development of infrastructure of residential and non-residential projects will be fueling the market. The increase in demand for aluminum powder will expand the demand for aluminum pigment in the market. The increase in nanotechnology with the broad utilization of aluminum nanoparticles is anticipated to expand the demand for aluminum pigment market globally. The high cost and value of machinery and raw material is likely to affect the market during the forecast period. They will be a stringent hindrance in the growth due to device evaluation and innovation. These factors will affect the new players in the market and make it even harder for them to sustain in the market. 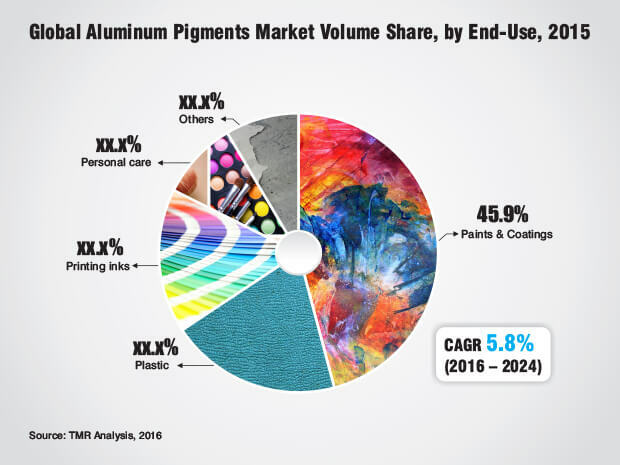 The rise in awareness among consumers for environment safety will likely hamper the growth of global aluminum pigments market. The shift in nature friendly paints and coating will remain a key obstruction for the growth of market. The trading ideas will also face hindrance during the forecast period.